This year, it seems like winter has unleashed its unrelenting wrath all over Toronto and the GTA. Treacherous snowstorms have been plaguing the city, leaving behind nothing but a vast blanket of white powder in their wake. And let’s not forget about those terrible windstorms we’ve been experiencing lately. All of these harsh and cold conditions can leave your lawn looking and feeling very much worse for the wear. Fortunately, spring is just around the corner and that means you can start revamping your residential or commercial outdoor space. Here are some awesome early spring lawncare tips to help you bring your garden back to life in the coming months. Before getting your hands dirty, you need to take a step back and truly assess the extent of the damage the weather has done to your lawn and plants after the snow melts. Figure out what needs to be done and then come up with a concrete solution to revitalize your dead plants and grass. 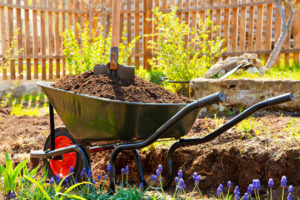 Most importantly, you need to take a look at the soil since it’s the foundation of your entire outdoor space and provides all of the nutrients your garden needs to thrive. When it comes to revitalizing your plants and grass after they’ve been dormant all winter long, you should learn to practice a great deal of patience. Realize that Rome wasn’t built in a day and it’s going to take some time restore your garden to its former spring glory—especially if you need to remove and replant certain plants. It may also take some time to restore the pH balance in your soil, which affects the health of your plants. A lot of debris gets buried under large amounts of snow and ice. During the winter months, it’s pretty much impossible to remove this debris because it’s frozen and stuck to the ground. Over long periods of time, this debris in addition to the ice and snow, blocks the air passages and disallows your soil to get the oxygen and nutrients it needs to be healthy. Once temperatures start to rise in late March and early April and the snow and ice have melted away, it’s important to remove the matted down leaves and other debris from your lawn to allow it to breathe a little. Make sure to completely clean up your outdoor space so that you can start taking good care of it, especially since most litter is not biodegradable and can damage your plants and grass even more than the frost. Post winter lawncare is extremely important when it comes to reviving your grass. Leftover matted down wet grass from the winter months can hamper the overall health of your soil by preventing it from receiving the important nutrients it needs to replenish the rest of your garden. That’s why it’s important to remove and properly dispose of all dead grass and leaves early in the spring so that you can slowly start preparing your lawn for its first mowing session once the snow and ice have completely melted away. Excellent plant health starts with high-quality soil. Unfortunately, the frigid winter temperatures combined with the massive amounts of ice and snow in the winter can cause the ground to freeze up and this can diminish the pH balance of your soil. Since soil is the foundation for having a healthy garden, you need to recalibrate the nutrient level of your soil to make sure that it’s in top growing condition come spring and summer. An overabundance of water from melted snow and ice can completely throw off the pH and nutrient levels of your soil. The best way to test and remedy this is to purchase a soil testing kit from your local garden center or hire a professional landscaping company to do it for you. Being trapped under the weight of heavy snow and ice for many months can cause your soil to become compact, which also cuts off its ability to absorb oxygen and other important nutrients. Once all the snow has melted and debris has been carefully removed, you need to aerate your soil to help it breathe a little better. Basically, this means poking little holes throughout the soil using a solid spike to improve air circulation and nutrition absorption. Weeds are much more resilient and likely to survive the harsh winter temperatures and frozen grounds than your grass and plants. Have you ever heard the saying “growing like a weed”? It’s derived from the fact that weeds can survive pretty much any kind of condition whereas flowers, grass, trees, and shrubs need to be carefully cultivated in specific growing environments. It’s not enough to simply clip or trim weeds. You need to pull them out directly from the root to prevent them from spreading their seeds and growing throughout your outdoor space. Depending on the severity of your weed problem, this can be a tedious task that’s better left to the professionals. Fertilizer is an excellent source of nutrients for your soil. The trick is to choose the right one for your gardening needs and then figuring out the appropriate amount to use as well as how often it needs to be applied. Consulting a professional local landscaper and gardening expert is your best course of action in this case. Annual spring lawn preparation is important because it can help revitalize your soil after enduring a long, cold winter. Even throughout the spring and summer seasons, you should continue to take good care of your lawn and garden to make sure that all of your plants and grass maintain good health. At FOREVER GREEN LAWN & LANDSCAPE INC., our team of expert landscapers and outdoor property managers can help you bring your commercial or residential outdoor space back to life this spring. We’ve been beautifying lawns and gardens in Toronto and the GTA for over 20 years and are very familiar with the local climates. Contact us today to schedule your free consultation with one of our lawncare experts!